The Colts pose in their new TNS-sponsored polo shirts. Curtis Revell grabbed a hat-trick as Wyberton ended Lincoln Moorlands Railway’s unbeaten start to the Lincs League campaign with a 4-1 win on the road. Ben Jaques was also on target against a side who had four players suspended following a series of red cards in last week’s Supplementary Cup victory against Immingham. Manager Joe Greswell was obviously happy: “Last week I put my neck on the line a bit, saying that we can compete with the best. “To be fair to the lads, they proved it. “We knew they were there for the taking after getting four defenders sent off last week and our front three of Revell, Kacirek and Lawrence were brilliant. “Saying that, we had to defend quite a bit in the second half and the back four of Gordon, Macleod, Butler and Pinner were outstanding again. The Colts led 3-0 at the break as they were on track for their third consecutive win. Revell got the first, slotting home a one-on-one before Jaques chested home a cross from the right. A back-post tap-in saw Revell get the third on 30 minutes. Moorlands looked a lot better in the second half but Wyberton answered all their questions. Revell completed his hat-trick from the spot after Pat Kacirek was fouled. Moorlands netted their consolation, also from a penalty. 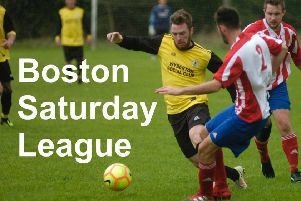 On Saturday Wyberton are on the road again as they travel to Immingham in the Lincs League (KO 2pm).